On first inspection the Alaska 42' Sedan is a beautiful vessel and it only gets better as you inspect the impressive engineering that makes this capable, Italian designed craft ideal for serious off-shore, coastal exploration. "Endless Summer" has been highly maintained and kept in perfect condition so she is ready to cruise at a moments notice. Equipment includes Track Vision satellite communications, desalinator, a 9.2Kva generator, bow thruster and a full range of Raymarine electronics including Radar. The twin Cummins diesels provide excellent economy using only 35 Lph at 15 knots and will provide a sprint speed of 22 knots when asked. The three cabin, two bathroom layout is capable of accommodating the entire family and there is additional sleeping for the whole team during annual Abrolhos Island trips. 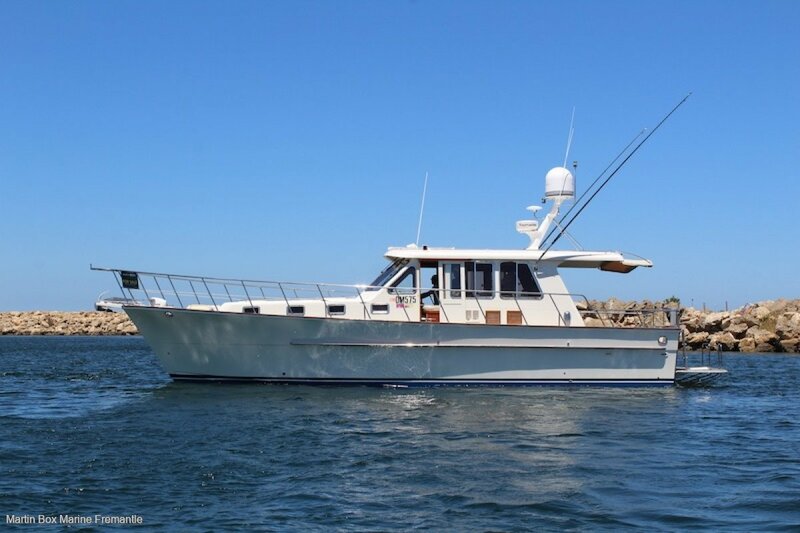 This gentleman's cruiser is a very rare offering and is genuinely offered for sale with an inviting asking price. Contact Jamie Dodd to arrange an inspection on 0418819181. Port side galley with loads of bench space and storage. Queen Double stateroom + Saloon Convertible double and three single bunks in two cabins. Maxwell anchor winch with dual anchors. 12/24 and 240 volt systems. Dolphin Battery Charger, ICOM VHF Radio, Raymarine/Furuno GPS, Plastimo Compass, Raymarine Auto Pilot and Radar, Furuno/Raymarine Echo Sounder. This gentleman's cruiser is a very rare offering and is genuinely offered for sale.